As was mentioned briefly by Mark Waid in a recent interview, one of the new developments we’d see with the relaunch of Daredevil this summer (July 20, to be precise) is a redesigned billy club. 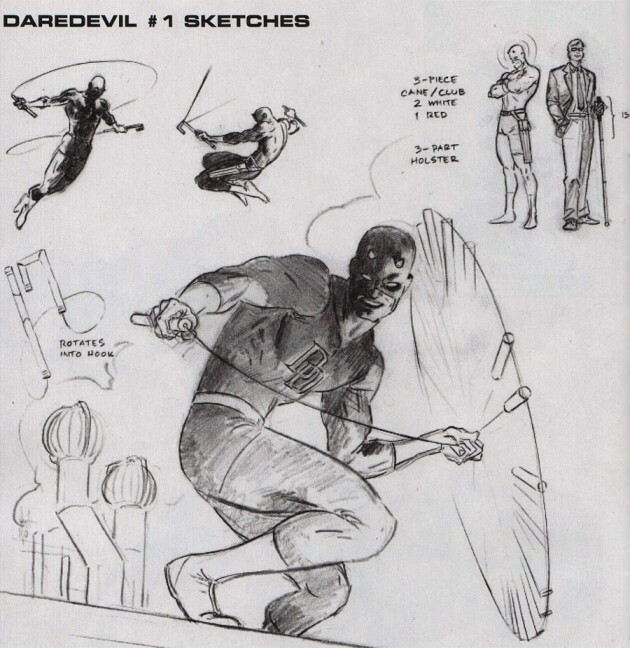 The May edition of the Marvel Previews magazine, which has been out for about three weeks now, shows some very cool schematic sketches by Paolo Rivera. After feeling that I’d waited a respectful amount of time, I decided to go ahead and scan sections of the preview artwork. So, below you’ll find two thirds of page 50 of Marvel Previews #93! So, what do I think of it? Well, first of all the art is insanely pretty. Secondly, I like that a great amount of time and effort has been put into designing something that actually makes sense as both a white cane and a billy club (longtime readers might recall that I’d basically started assuming that the idea had been abandoned, and rightly so under the circumstances). Sure, it’s still a bit of a stretch to imagine the same materials being used for both objects, but on the whole, I think it works. Now if only the artists would consider making the cane a bit longer (enough to reach his sternum or higher), I’d be even happier. Oh nice. I like it. It’s not a radical change or anything. It is still familiar, but it makes a little more sense now. I really look forward to see Paolo Rivera’s work in DD: He’s one hell of a draftsman and channels beautifully the early Marvel style. I think it’s great. The fact that they’re addressing something that no writer has really even thought of in a long time is encouraging for me. It makes me think they are really trying to help the character grow. Dealing with what most readers would feel is a minute detail like this tells me they are putting a lot of care and creative thought into it, which is a very good thing. The combination of modern and retro art is a dream come true for me. I have an appreciation for some of the more modern art (even a small amount of manga influence is ok) but my heart will always be with the retro style. So seeing the best of both together is great. I really didn’t think I could ever get over my cynicism towards monthly comics after what happened with Shadowland, but seeing this and the most recent CBR article (good interview and issue #1 art revelaed) has sold me. I love that the team appears to have a more collaborative way of working and the promise of DD displaying his dry sense of humor again makes me feel very hopeful. I’m at least going to give the first issue a chance, but I have a feeling that I won’t be disappointed and will be sucked in to buying monthly again. 1. I hate when it’s drawn so stubby it looks like he’s fighting with a Sharpie. 2. I love it when Matt makes it ricochet off a bunch of stuff to hit a target (bonus when it returns to his hand). 3. There is no way you can fit 30-45 ft. of aircraft control cable into a billycub along with a mechanism to fire it (but I’m very glad they ignore that fact). 4. I love the snoop scope. 5. I love when Matt jumps through an entangled mess of line. 6. I hate when they put the holster on the wrong side or just leave it off (really bugs me). 7. I hate when non-fans think they’re nunchuks. To Bill, about 6., I hate it too and sometimes feel like a uber-geek for noticing it. De la Torre drew it on the wrong side and I couldn’t help being pissed off because of that. I wasn’t talking about just giving DD new, different colored clubs or changing the concept like Chichester and Bendis did. They’re not just giving DD new billy clubs, they’re making Stan’s original concept (billy clubs that double as his cane) work and, as you said, “paying attention to it its functionality.” I hadn’t really noticed that they never made the cane the right size or style until Christine pointed it out in one of her articles. But how could you make it the right size when the cane only breaks in to two pieces that are somewhere between 14-16 inches long? It’s reassuring that they actually thought about rectifying that and making the cane look like something a 21st century blind man would use. Many moons ago during the original run of Marvel’s Handbook of the Universe, #15, written & drawn by the esteemed Eliot R. Brown, was a whole gadget issue, devoted to all the tech & gadgets used by Marvel characters. Among them, DD’s billy club. I don’t think Brown had 30-45 ft of cable in it, but the details about it being the cane, the separate clubs, and the line were interesting.